Party Starters! 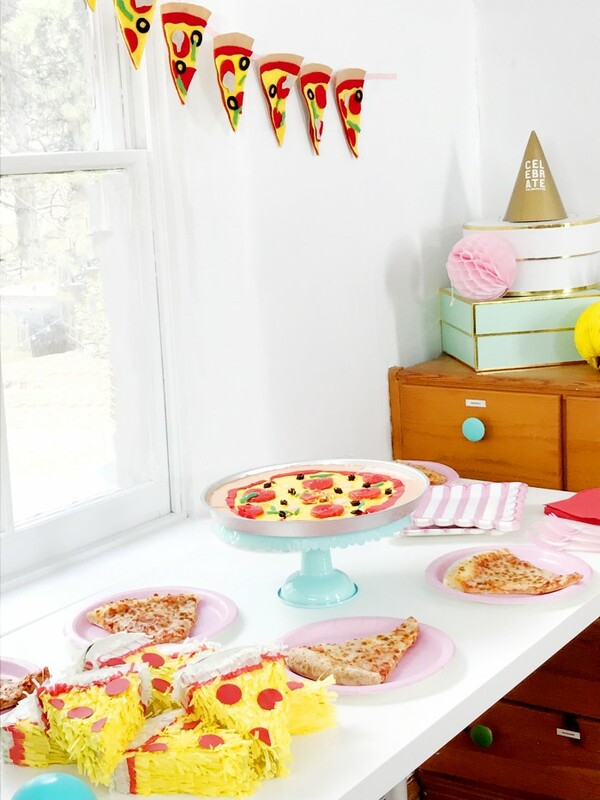 How to Throw a Sprinkle Party! Sprinkles, sprinkles, and more sprinkles! 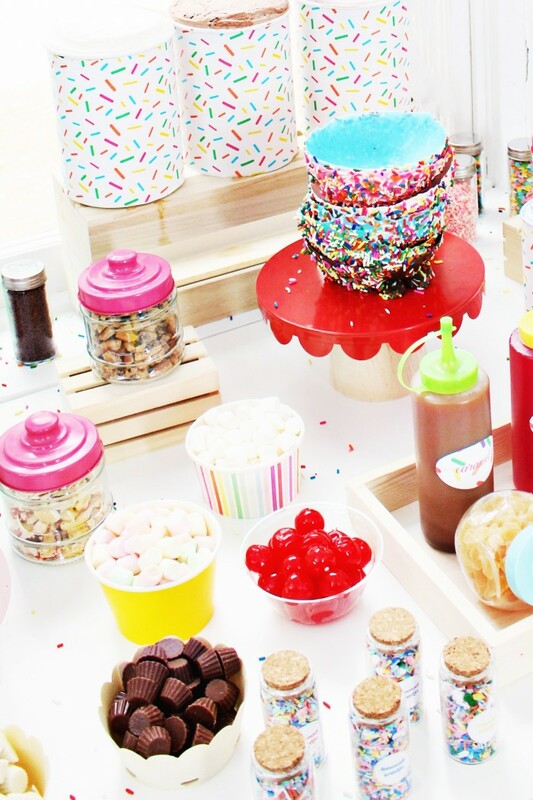 With a decked-out ice cream bar, homemade sprinkle recipe (and free printable labels! 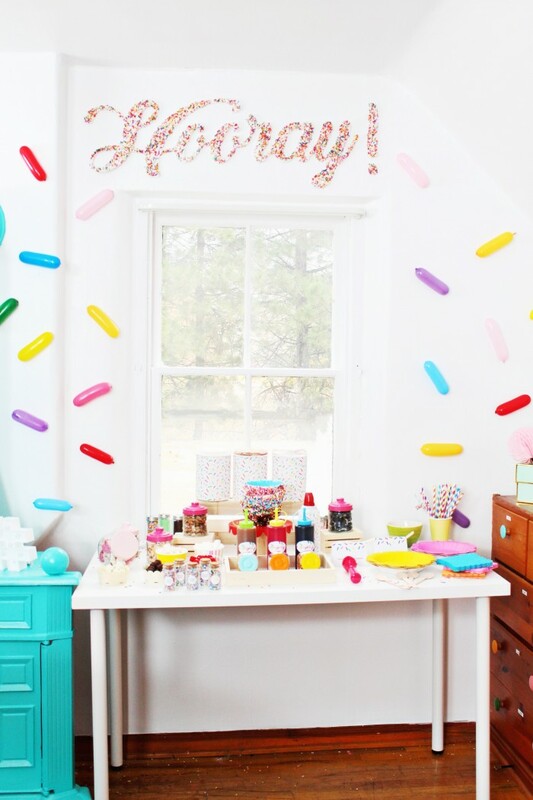 ), and a sprinkle-covered letter backdrop, this party is sweet all over! Is there anything cuter than sprinkles?! Like, in the world of party supplies at least. You just cannot go wrong with a smattering of sprinkles! So we were totally on board when food.com wanted this to be a theme for one of our Party Starters videos. Even better-we didn’t just cover everything in sprinkles, but we had a full-on ice cream sundae bar! And it was basically the ice cream bar of your dreams let me tell you! We seriously had all the fixin’s you could ever want on your ice cream: syrups, mini candies, crushed cookies, cherries, and of course SPRINKLES! Well I started my next semester of school this week! I am still working on my bachelors degree. I graduated high school 10 years ago so that’s about how long this has taken me so far. I’m not doing anything special and I’m not even a real big advocate for college in general (Malissa will shudder when she reads that, we’ve always disagreed here haha) but I’ve just been so far along in it for so many years now that I definitely want to finish! For some reason, I thought it was smart to go the slow route. Continue in a part time job and with the rest of life and just do what I could on the side. Looking back, I don’t think this is smart financially. But, it has served me pretty well and even regretting it, it’s still what I continue to do. Just one to three classes here and there. Now, with two kids, I really don’t have any other choice. I can’t just go 15 credit hours a semester, so I’m doing what I can. Regardless of how long it’s taken me, I am continually grateful that I have the choice. The choice to go slow, the choice to go part time, the choice to take a semester here or there off, just the choice to go at all! And its really not much harder than that. I decide, “hey, this semester looks good!” and then I sign up for classes, make some arrangements for my kids, and then go. That’s basically it. Unfortunately that is a lucky way to get to live. It wasn’t that long ago when many people simply didn’t have the choice. And it was even more recent when women didn’t have the choice at all. Even sadder still, there are still places in the world where women don’t have that choice or opportunity. I am eternally grateful for all the women who came before me who helped to blaze the path of equality, especially for education. Whether I believe college is the one true path to success or not, I do believe it was the path to many, many women’s success and it levels the playing field in ways nothing else has or ever could. In order to pass on that gratitude just a little bit, we actively look for ways to continue blazing that path for those who aren’t so fortunate yet. 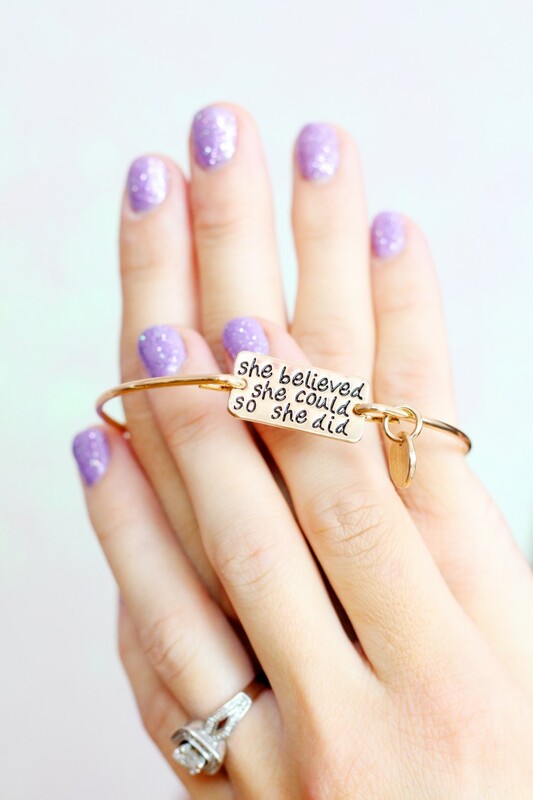 So when we saw this She Believed She Could Bangle we were happy to nab one for ourselves and share their message. A portion of the proceeds goes to help provide young girls in developing countries with the basic right to an education. 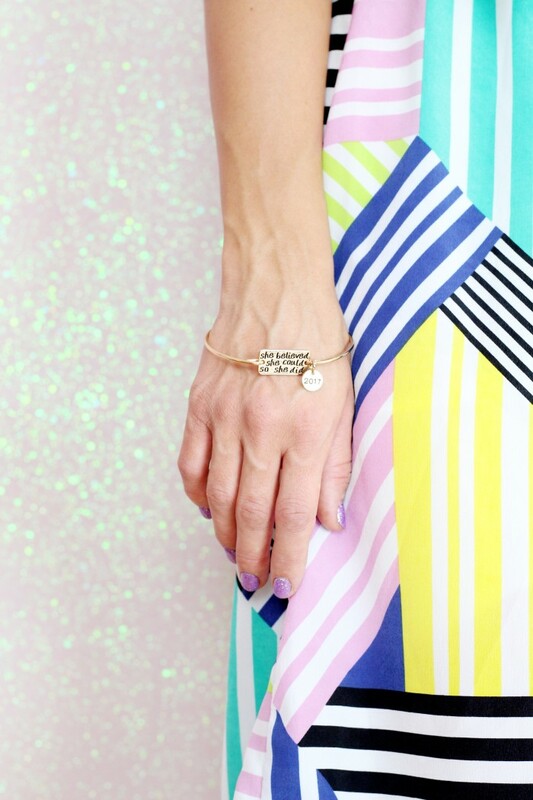 The people behind this cute little bracelet believe that education is central to ending global poverty and we couldn’t agree more! 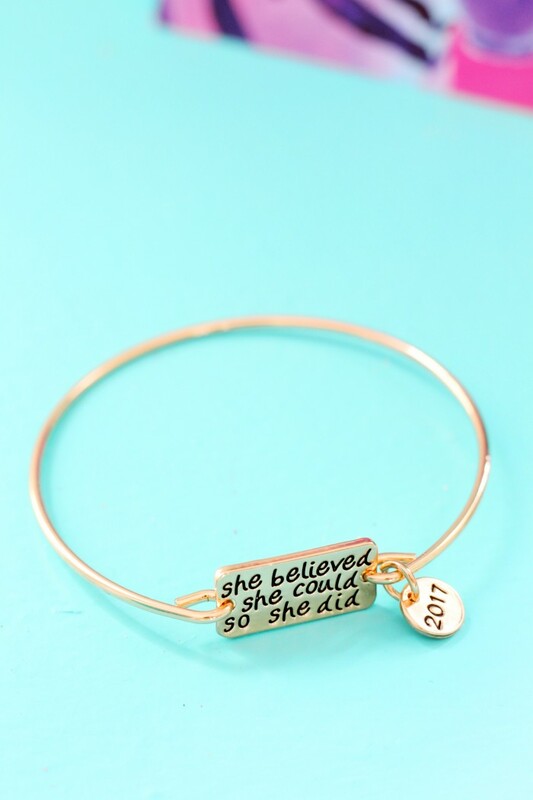 Because we do believe that education is a fundamental right, and that it is an essential part of creating a better world, we love this bangle project. It comes in silver or gold, and it features a delicate style that goes with basically everything and rests comfortably on your wrist. For me, comfort is paramount with bracelets. I cannot stand when a bracelet interferes with my day at all! When I’m typing, or crafting, or changing a diaper (lol), I need my jewelry to stay out of my way. And this bangle is light enough that I don’t even notice it going about my tasks but lovely enough that I feel good wearing it. Plus, who doesn’t love this quote? So if equality is your thing (it should be! ), or you just like cute bracelets (who doesn’t? ), or this quote inspires you (it inspires me!) then this bracelet is for you! You can get your own right here and feel good about this little purchase. 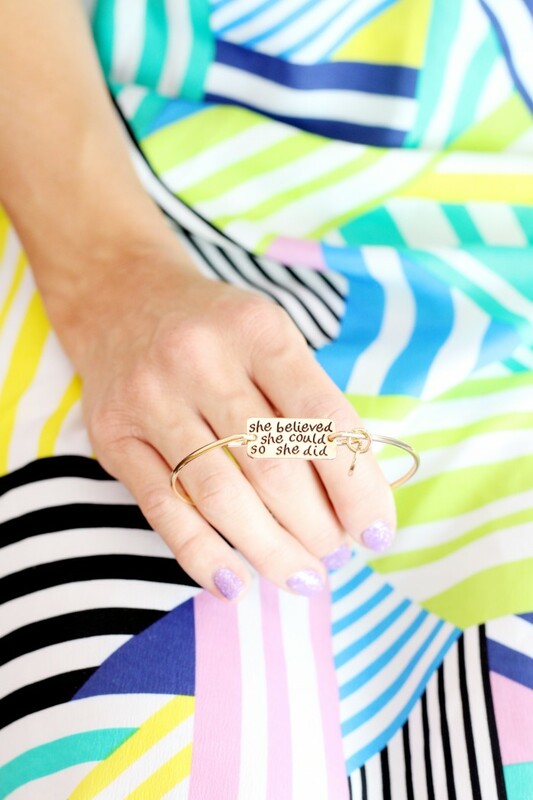 We received this bangle for free in exchange for helping to pass along the message of education equality. All opinions expressed here are my own! Thanks! Everyone loves pizza! 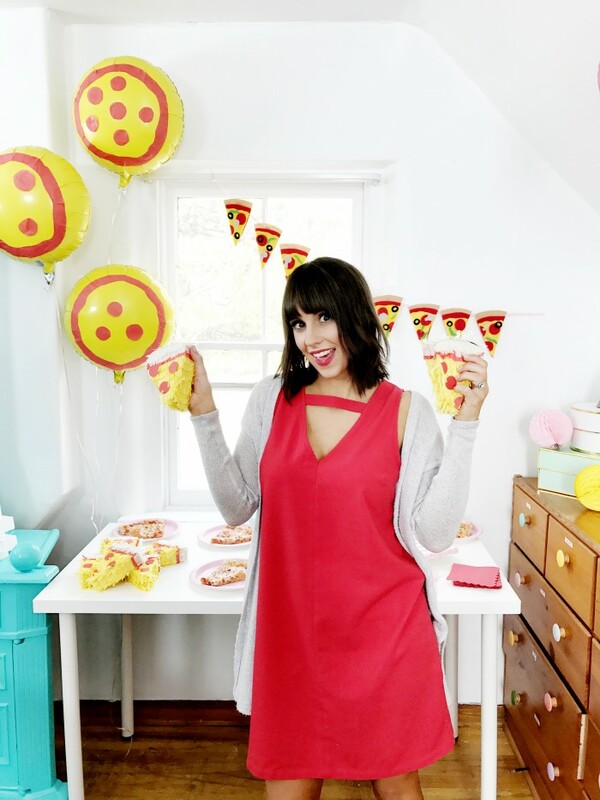 In this short video, we show how to put together a cute pizza themed party featuring a giant pizza cookie, felt pizza bunting, and mini pizza piñatas for party favors! Welcome to our second installment of Party Starters! 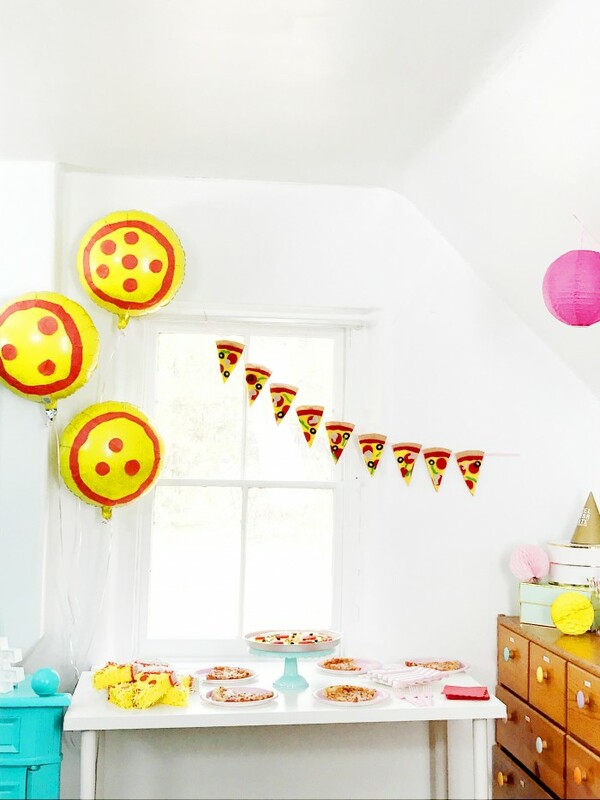 For this party, all the food, decor, and favors were modeled after everyone’s favorite food: pizza! The whole video (it’s only 4 minutes long!) can be found here. It shows how to make each DIY and showcases the whole party set up. We’ll be linking to each individual project below and sharing some back stories so keep reading! This was the first party we shot and because of that, there is a real lack of photos to share! We promised behind-the-scenes shots into every party but the reality was that the first day got off to a bit of a slow start! We weren’t totally sure how the whole set up was going to go or what the production team had in mind so it took a little while to get ready. By the time this party was done we felt the need to rush into the next one so we could finish them both in the same day. But being the first party, there was definitely a learning curve for this one, so we were all glad we got the easiest party out of the way! And I was extra glad that we chose to do the easier parties this day because I was completely exhausted! We talked a little bit about why it was all so tiring in our Donut Party post the other day but there was a whole other story/disaster/nightmare that happened the night before this first day of shooting. Party Starters! How to Throw a Donut Party! 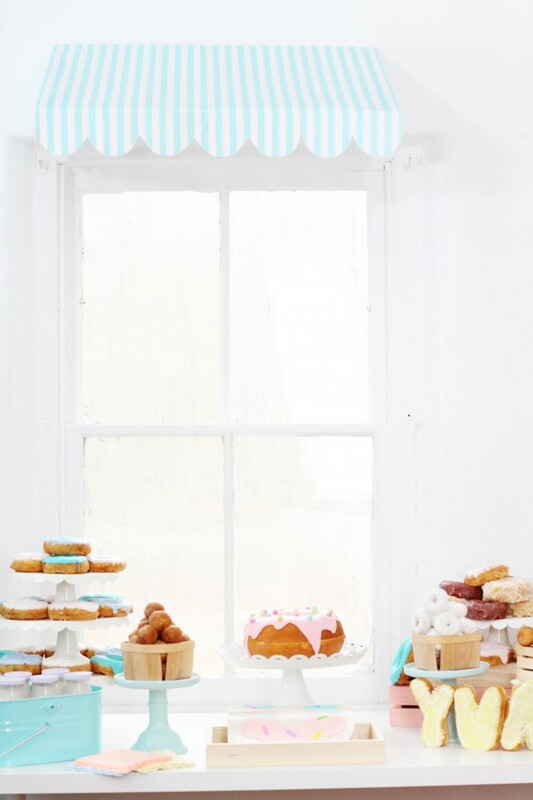 Sweet donut clutches for your gal pals, an oversized donut cake, and a donut-shop-inspired paper awning make up the basics of this pastry-themed fete! Are you ready for our Party Starter videos!? Today we’re sharing the first of four (thats right FOUR) parties we designed and shot with food.com! With three accompanying DIYs each, the next month is full of great projects that we think you will love! We shared more about the genesis of the videos, and sneak peeks of all the parties, here. First off, let me tell you that both of us are still a bit nervous to share these videos with you (you know how they say the camera adds 10 pounds and all that?) but we are so grateful for the opportunity and in many ways we do love how they turned out so we are going to share them with you all regardless! The first one is our pastel donut shop party! The link to all the projects, videos, step-by-steps, and photos can be found right here but keep reading for some fun tidbits and inside looks! I have talked about how much I am obsessed with donuts before and they still remain my favorite snack of all time. This was also the video we filmed last so you better believe the second it was over that I immediately grabbed like three donuts and scarfed them down. For those of you who are wondering, the donuts are from Provo Bakery and yes they were delicious! They did a great job matching our icing requests and the lettered donuts are definitely a fan favorite! 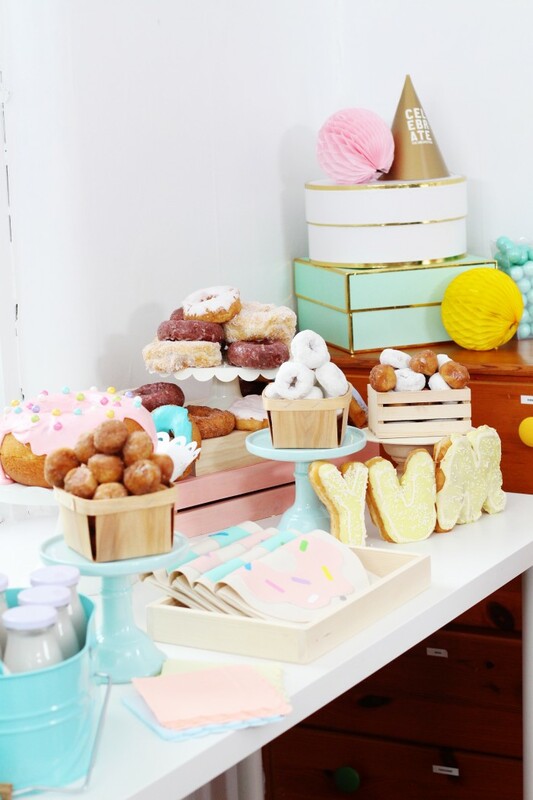 As teased last week, each party included an easy recipe, DIY favor and DIY decoration and I think the favor for this party (the donut clutches!) is the cutest one of all! Below we’ve linked to all the videos, plus the whole party shoot! PLUS every project has it’s own step-by-step instructions with photos in case videos ain’t your thing. 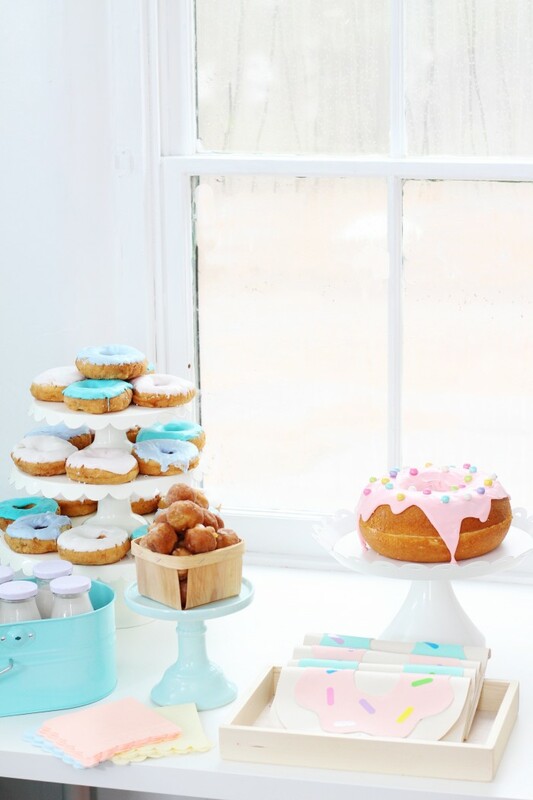 We’ve thought of everything you need to throw the cutest little donut party ever (and make everyone want to be your best friend)!